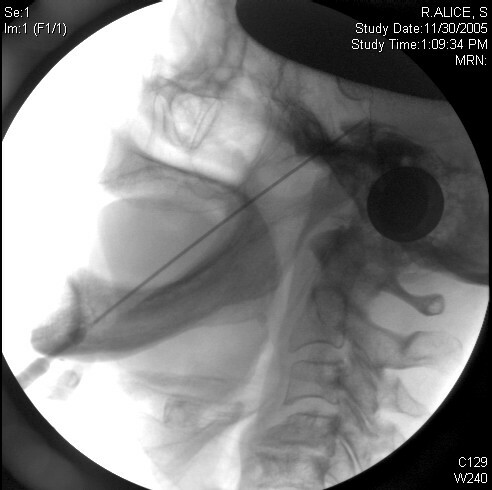 Fluoroscopic view (X-ray) of side view of face, needle passed thru base of skull thru foramen ovale. At the tip of needle is contrast injected outlining trigeminal cistern. Once the needle position is correct, glycerol is injected around the nerve. This procedure has the lowest risk of causing numbness compared to other percutaneous procedures. Patients are discharged a few hours after surgery. The main treatment options for TGN if medication is not working are the Jannetta procedure, rhizotomy, and radiosurgery. Your doctor can discuss with you which option for treatment is best for you.